One of the iconic handmade Crossing Place Tail guide signs. The Crossing Place Trail is a very scenic coastal area that’s typically deserted. Be sure to bring plenty of water and expect intense sun. Beware of hidden holes when walking through the low vegetation above the cliffs. 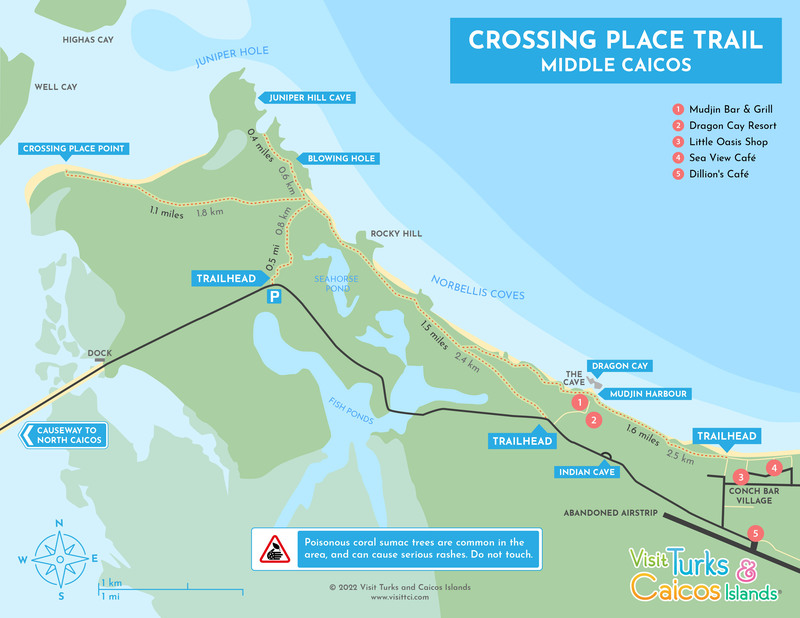 The Crossing Place Trail is a historical path that used to connect the communities on Middle Caicos and North Caicos. The trail offers spectacular views of the Mudjin Harbour and Norbellis Coves coastline, with many interesting features along the way. The Crossing Place Trail at Norbellis Coves. 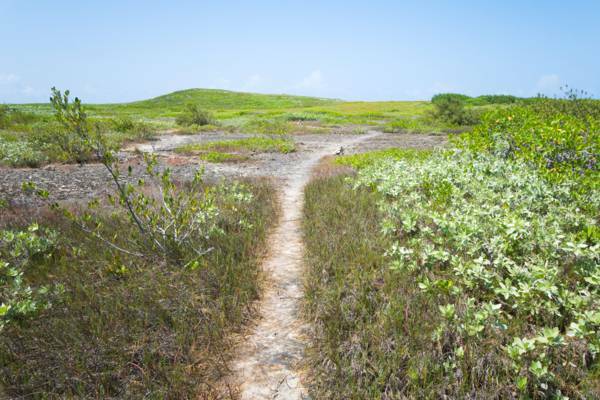 Over the last couple centuries, the Crossing Place Trail was the main link between Middle Caicos and North Caicos, and by extension, the whole of the Caicos Islands. 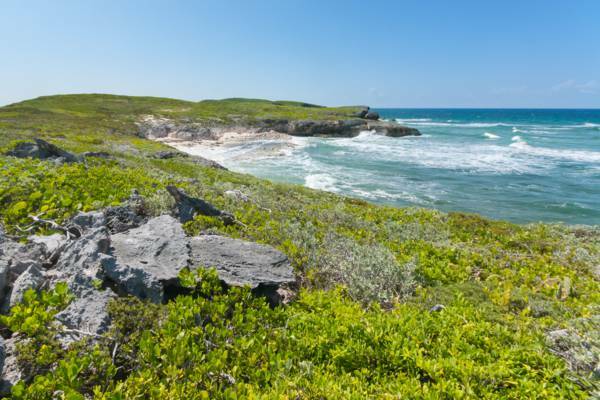 The trail originally began at the village of Lorimers on the eastern end of Middle Caicos, and wove west through the plantations and settlements of Middle Caicos, ending at a Crossing Place Point. Here, at low tide, travellers were able to wade over to North Caicos. Over time, the trail fell into disuse and was overgrown by vegetation as the use of power boats was introduced to the country over the last several decades. In the late 1990s, the Crossing Place Trail was refurbished by local volunteers and the TCI National Trust. The paths were re-cleared and guide signs were added. The current Crossing Place Trail only covers a small portion of the original path and deviates a little in places from the original. The Crossing Place Trail offers many breathtaking views of the limestone cliffs of Mudjin Harbor. 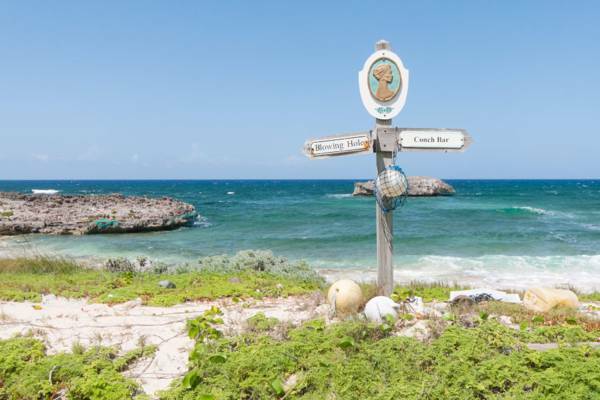 The main beginning of the modern trail starts at the coast near Conch Bar Village, but two trailheads also start off the paved road into Middle Caicos, and one near the Dragon Cay Overlook at Dragon Cay Resort. The trail surface conditions vary a huge amount. Near Conch Bar, the trail tends to be packed dirt, but it gradually turns rocky and sandy further along. West of the blowing hole, the trail slowly disappears into the low vegetation. See our Crossing Place Trail map. 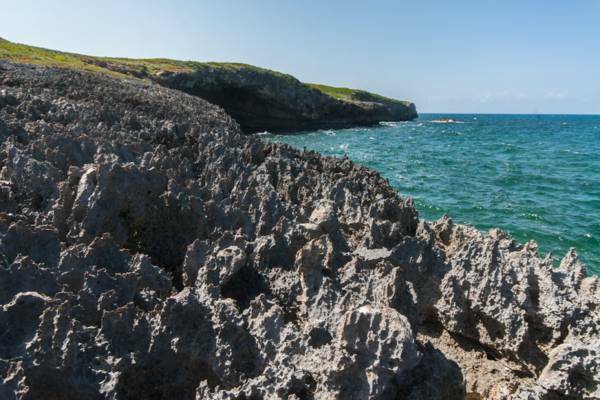 The whole length of the Crossing Place Trail covers the amazing limestone cliff scenery and interspersed beaches of Mudjin Harbor, with many interesting spots. 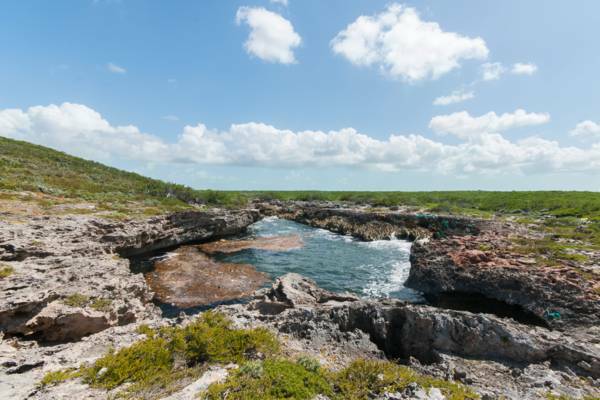 Dragon Cay and the adjacent overlook is considered to be the center of Mudjin Harbor and the finest landscape in the Turks and Caicos. A large open-faced cave can be seen above the beach and masonry foot paths put in by the adjacent Blue Horizon Resort make access easy. Follow the Crossing Place Trail signs when hiking from Conch Bar Village. The Blowing Hole is a very small body of water connected to the ocean by a 75 foot long under water cave. In the past, this formation was actually a sea cave with a hole in the roof. When a large wave would enter the cave, water would be blown high into the air. The roof of the cave has fallen in over time, but large amounts of flotsam collects here, and the spot is still quite interesting when the surfs up. Found near the far western end of the Crossing Place Trail, Juniper Hole is a large open-faced sea cave. There are several holes in the roof of the cave, but it’s not possible to enter the cave and caution should be observed around the cliffs above the cave. Cliffs, hidden holes and sharp rocks are the greatest danger to hikers on the Crossing Place Trail. Due to the rugged limestone makeup of the area, loose rocks, sink holes and small caves are abundant. Many small holes are hidden in the low bushes, so be sure of where you walk when off the trail and take your time over the rough spots. It’s advisable to wear shoes or boots. The conditions on the Crossing Place Trail vary from soft sand to loose stone and sharp rocks. Coral Sumac, also known as Poisonwood, is a poisonous tree found in many places along the Crossing Place Trail. 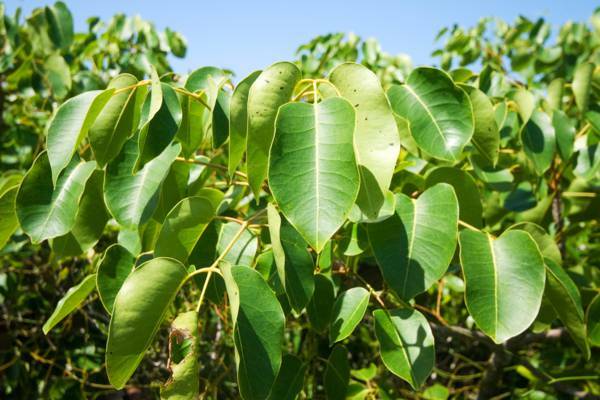 For most people, even lightly touching this plant will cause rashes, and any contact with the sap of this tree will result in serious blisters and skin issues. This tree is most common in the inland sections of the trail, but can be found anywhere. The majority of these trees in the Crossing Place Trail area are less than ten feet tall, but in sheltered areas, thirty foot examples are not uncommon. Dehydration and sun burn are another concern. There is little shade along the Crossing Place Trail and conditions are usually very hot, as is typical for the Turks and Caicos. Be sure to bring plenty of water and sunscreen. Mosquitoes can be quite bad at times in the inland swampy sections, so don’t forget insect repellent. Generally, the main sections of trail along the coast are fine as the breeze keeps the mosquitoes away. The low swampy sections tends to have lots of mosquitos, so be prepared. Several businesses offer guided hikes and bike rides over the Crossing Place Trail. 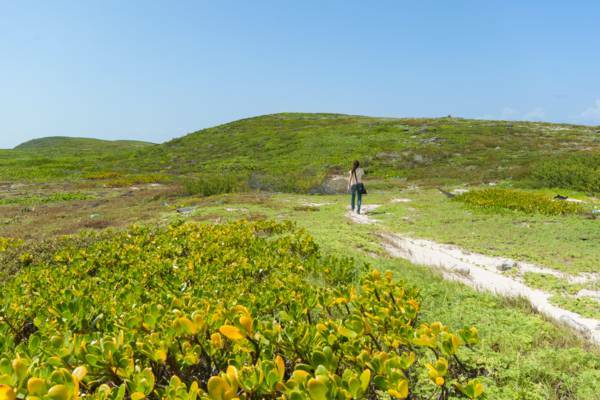 One of these excursions can be a great way to get some extra insight into natural and cultural history of Middle Caicos and the Country. 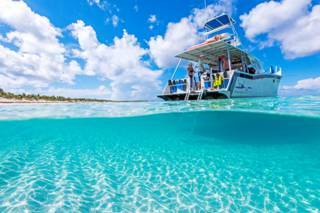 Big Blue Collective's tours to North and Middle Caicos offers guides tours of the Crossing Place Trail.